Victims of the 2010-2011 post election crisis in Cote d’Ivoire vent their anger Wednesday in Abobo (a popular neighbourhood in northern Abidjan that supports President Alassane Ouattara) in protest against the “immediate acquittal and release” of former Ivorian President Laurent Gbagbo, which was ordered by the International Criminal Court (ICC) on Tuesday. Composed mainly of women, they erected barricades here and there at the Abobo-Banco roundabout where women had been killed during the crisis, and disrupted traffic on this important road in the municipality. “If the ICC commits to release Mr. Gbagbo, let it also assume what will happen afterwards. 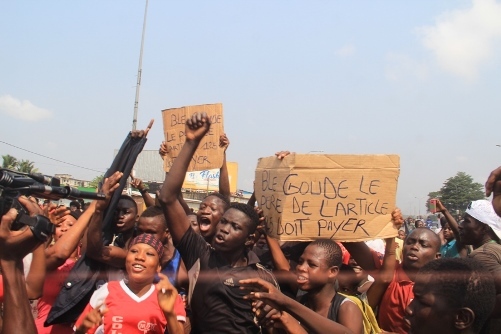 If there is a second war in Cote d’Ivoire, it’d be the ICC’s fault because it is unable to try the perpetrators,” other demonstrators said. After the ICC ordered Gbagbo and Ble Goude’s “acquittal and immediate release” on Tuesday, his supporters were jubilant in Abidjan, particularly in Yopougon, a neighbourhood known to be his stronghold in western Abidjan. Gbagbo and Ble Goude faced prosecution at The Hague since 2011 on four counts including war crimes and crimes against humanity, allegedly committed during the 2010-2011 post-election crisis, when officially 3000 people were killed.